The other day I wandered over the railroad tracks and into a nicer part of town -- and I noticed inside a garage was an MGB GT parked next to an Audi R8. Wow. That is a strange combination...but it makes sense if the owner was rich enough to afford the R8, but still wanted something sensible and classic for cruising. Most of us normal folks aren't going to buy an R8 in the near future...so...I'd like to post the question -- what goes next to an MGB GT if you wanted something fun and less than $20k. If you've already got the MGB GT for classic weekend cruising, the car you need is something modern, with lots of horsepower, and a big back seat. 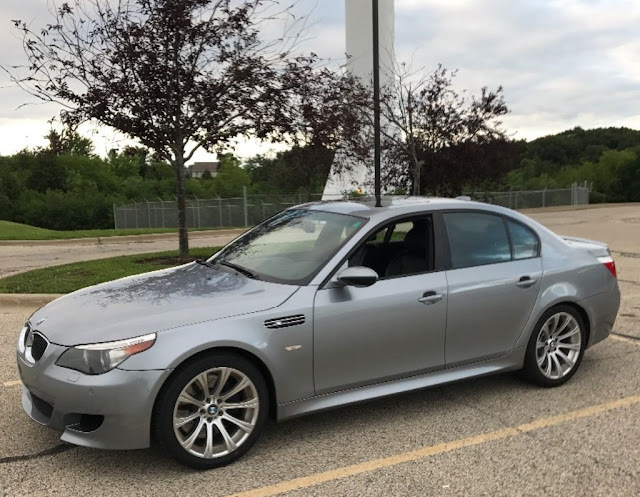 I'm going to pick this 2006 BMW E60 M5 offered for $17,000 here on eBay buy-it-now or make-offer located in Round Lake, IL. The 500 horsepower V10 will scream as you mash the paddle shifters in a way that is fun, but a completely different sort of fun from the MGB GT. What do you suggest? Comments blow. It seems like the answer in general from this group is either: a) Miata or b) Roadmaster. Just saying. I'd go with the "It's great for a gearhead to have a truck" school of thinking here. So I'd either pick a Chevy Avalanche if you needed a back seat - or a Dodge Ram with the Viper V10 if you can find one in your price range and don't need that extra back seat.